Captain Kip Mammano is a Rochester native and a graduate of SUNY Plattsburg. Kip is passionate about the outdoors. An Avid snowboarder, snowmobiler, hunter, and fisherman. It is that last one (fisherman) that truly defines Kip. He has had a pole in his hand and fish on the mind since he was 4 years old. Fast forward 30+ years and Kip Mammano is now Lake Ontario's most dedicated fishing captain. Kip will treat you like family and show you the time of your life on the beautiful waters of lake Ontario. Kip uses the latest technology and an almost sixth sense to locate and catch some of the biggest fish on the water today. 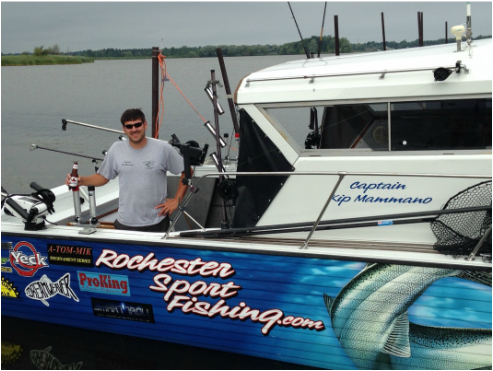 Brandon White is Rochester born and raised has been fishing the surrounding bodies of water his entire life. He has been a dedicated Walleye fisherman since early childhood, but can put you on almost any species of fish.